Loss of hair anywhere from the body is called alopecia. 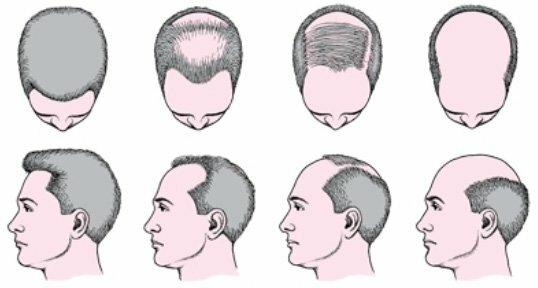 Loss of hair is natural phenomenon during the hair growth cycle. It is estimated that most individuals lose about 100 scalp hair per day. Hair loss can become a cosmetic problem when it occurs in the wrong place at the wrong time in the wrong individual. When more hair is lost then this may be the result of some underlying disease or effect of hormone and or genetic predisposition. Two major categories of hair loss are described. This is irreversible hair loss characterized by damage to the underlying skin which results in scarring that destroys the hair follicle and its potential for regeneration. This is permanent because hair follicles have been destroyed. Burn and trauma is most common causes. This type of hair loss is very common and can be due to many causes, including certain diseases, drugs, aging, diet, as well as a genetic predisposition for hair loss called androgenic alopecia (common balding). This is non-scarring alopecia precipitated by hormones in genetically predisposed hair follicles. Occurs in both male and female. In male anterior hair, a line starts receding and frontal baldness takes place. This may further progress leading to loss of hair in the crown area also. In female hair loss is more generalize and usually anterior hairline is preserved. A diet deficient in essential nutrients can also precipitate hair loss. 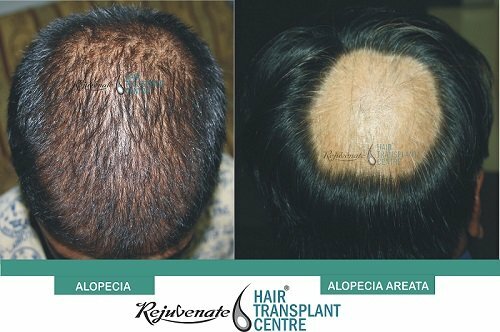 Alopecia areata, a non-scarring alopecia, is thought to be an autoimmune disease and is characterized by distinct, localized, sharply marginated areas of hair loss. This characteristically spontaneously remits but occasionally can result in the loss of 100% of all scalp and even body hair. 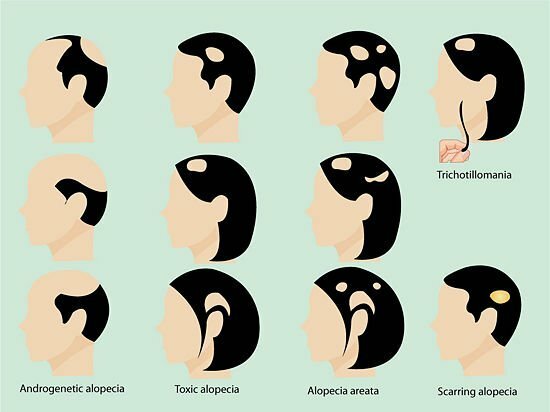 When all scalp hair is lost it is called alopecia total is an all body including scalp are lost then called alopecia universalism. Other uncommon causes of hair loss are—Infection like syphilis, skin disease such as lupus, skin cancer, hormone imbalance, liver or kidney failure, thyroid disease etc.